Join us for Minnesota’s premier Sport Analytics Conference the Friday before Minneapolis hosts the Super Bowl! Starting 11 CEO Teague Orgeman will be moderating a fantasy sports panel and will be pitching the company at the Sportcon event. Explore the many ways in which data-driven decision making continues to play a major role in sports, with a stellar lineup of speakers from academia, professional teams and the tech industry. This free event is perfect for sports fans, as well as analytics enthusiasts from any field. Learn more at minneanalytics.org/sportcon. Check out Starting 11 and a group of fantastic MN sports tech startups at the Super Bowl week showcase on January 30! Registration and details here. It’s Super Bowl week in Minneapolis! Join us to celebrate the breadth of innovation across the Startup Capital of the North. We can’t think of a better way to share our Northern pride than showcasing great ideas from Minnesota's leading startups, including the rapidly growing sports tech community. The event will kick off with presentations from the founders of an all-star lineup of MN Cup winners over the past decade. Following these updates, we will be hosting a demo hour of the emerging local sports and student startups. Join us for appetizers and drinks to connect with leading entrepreneurs and celebrate the Startup Capital of the North! We're proud to have been named to MinneInno's inaugural 50 on Fire awards list! MinneInno's 50 on Fire Awards are designed to shine a little extra light on the local individuals and businesses truly setting the local startup scene on fire. Join us on January 24 at the 50 on Fire awards event to celebrate the Twin Cities tech and innovation ecosystem. Tickets are here. TechdotMN founder Mike Bollinger interviewed Starting 11 co-founder Amanda Heyman at the 2017 Beta.mn event. 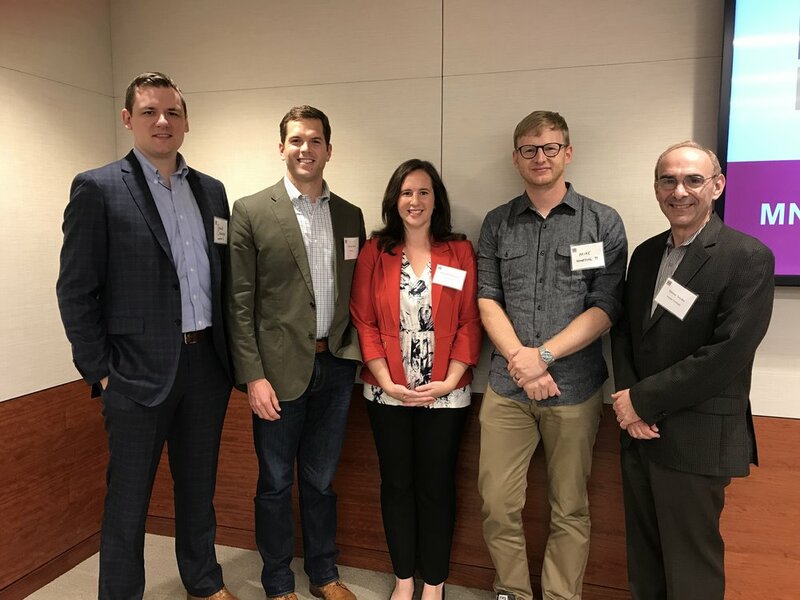 Thanks to the attendees at the MHTA Minnesota Venture Conference for awarding Starting 11 second prize for CEO Teague Orgeman's one-minute pitch. Congratulations to Peacebunny Island for taking first prize and Recombinetics for taking third prize. Thanks to Beta.mn for a fantastic night with the local startup community. We had a chance to tell our story and hear direct feedback and questions from hundreds of interested attendees. The most frequently asked question was "How do you play?" -- and we have all the answers in the short video below. Take a look and also check out our FAQ section. We're a Twin Cities Startup Award Nominee! We're proud to be in such great company. Congrats to all of the nominees! Starting 11 Wins Minnesota Cup High Tech Division! Starting 11 is the winner of the Minnesota Cup High Tech Division! We are so proud of our team and excited to keep moving forward in the competition. We'll be competing for the Minnesota Cup's $50,000 Grand Prize on October 9. Good luck and congratulations to all the Division Winners! The Starting 11 team and our fantastic MN Cup mentor, Steven Snyder. Click here to read this week's Starting 11 newsletter, full of fantasy tips, strategy and more. You can also subscribe and read past issues. Learn how to play Starting 11 in three minutes! Thanks to our friends at FPL Tips. Top scorers on Starting 11 for Gameweek 3's Saturday matches. Top scorers on Starting 11 for Gameweek 3's Sunday matches. Tech.mn covers the tech-related 2017 Minnesota Cup Finalists, including Starting 11. Starting 11 Is A Minnesota Cup Finalist! Starting 11 is proud to announce that our team has earned a finalist spot in the Minnesota Cup venture competition's high tech division. Minnesota Cup is the largest statewide startup competition in the nation, with entrepreneurs competing in eight divisions. Over 500 teams entered MN Cup this year, with only 24 teams advancing to the final round. Over $450,000 in prize money is at stake. Starting 11 is one of 2017's 3 high tech division finalists along with language-learning startup Extempore and youth tryout app Team Genius. One winner and one runner-up from each of the eight divisions will be announced in late September. Each division runner-up will receive $5,000, while division winners receive $30,000 and a shot at the $50,000 grand prize and $20,000 second prize to be awarded at the MN Cup awards celebration on October 9 at the University of Minnesota. More than 13,000 Minnesotans have participated in MN Cup since it began 13 years ago. Finalists have gone on to raise more than $230 million in capital to support the development of their ideas, create jobs, and broker numerous business partnerships, collaborations and distribution agreements. Click here to read this week's Starting 11 newsletter, full of fantasy tips, strategy and news. You can also subscribe and read past issues. Fantasy Football Pundits offers Gameweek #1 Starting 11 picks - check it out here, and read their primer on Starting 11 here.